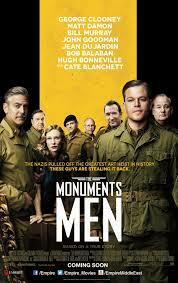 The Monuments Men is a true story about a small group of men, well past there primes, that go into WW2 to save art from the war. This movie did a couple things right. The absolutely stellar cast alone got me excited to watch this movie. After seeing the cast I watched the preview to get an idea of what I was going into, and it to was amazing. The tone, the music, mild humor, action, and acting,absolutely an amazing trailer. What I want to know though is how they took all those things and made one of the most BORING movies I have ever watched! The Monuments Men is not a particularly long movie, and it is not a particularly bad movie, BUT it drags on at a sinfully slow pace. I don’t believe it was the actors faults, they are one of the few things that don’t bog this down. The savior of this movie was Bill Murray, whenever Murray was on screen I was as entertained as this movie was going to get me. The concept was good, and I was interested in the story, it’s why I stuck it out, I just wish it was better executed. Thank you! It means a lot to have someone read my ramblings and like it enough to comment. And ya I rewatched the trailer after the movie, and its just a phenomenal trailer. It’s almost like they tricked us. Great review! I also reviewed Monuments Men. I also had the privilege of listening to the author of the book live at USF in Tampa last year.